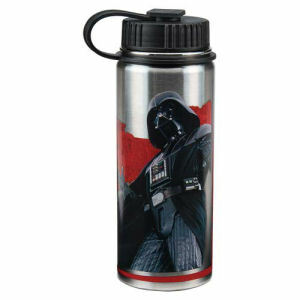 We have Just Sold out of Star Wars Dark Side 18 Ounce Vacuum Insulated Stainless Steel Water Bottle. Not to Worry! Fill in the Notify me When Available and you will be the first in line for our restock of Star Wars Dark Side 18 Ounce Vacuum Insulated Stainless Steel Water Bottle !! From the Star Wars collection by Vandor. Star Wars Dark Side 18 Ounce Vacuum Insulated Stainless Steel Water Bottle. This 8.5 inch tall bottle keeps drinks hot or cold for about 6 hours. Hand wash only. Not dishwasher safe. Do not microwave.